Here we go again, folks, in one of the world’s greatest cities architecturally. 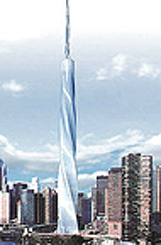 The Santiago Calatrava Fordham Spire planned for the lakefront, unlike the botched-up Skidmore redesign of the World Trade Center in NYC, may actually get built as the designer intended. Calatrava is new to the Windy City, but hardly an unknown name in international design, having completed bridges and buildings in Argentina, France, Italy, the Netherlands, Spain and the United States. It seems that his architecture is defined by his sculpture and perhaps by his bridges as well. Architecture, in these days of reach and stretch has much in common with bridge building. The ice-sculptural effect of the planned Fordham Spire in Chicago is achieved by rotating each of the 115 floors by a subtle two degrees to twist 270 degrees total from bottom to top. Chicago deserves this building. Chicago is a city pretty much without a false sense of itself. A long way from its former days as ‘hog butcher to the world,’ it is perhaps the most widely diversified major city in the country, a center of arts and commerce situated smack-dab in the center of population and time-zones. 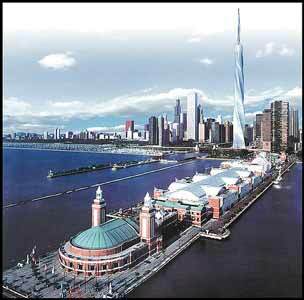 One look at the setting within which the Fordham Spire will be situated gives a sense of Chicago elegance. Graceful, surprising, fun and inspiring; all the things that architecture promises to be but so often fails to produce. If you have an interest in such things and want to check out the Calatrava web site, you’re sure to learn something . . . even if it’s the fact that world-renowned architects need not have egos the size of Donald Trump’s.